I've recently come across a couple of fun apps for mobile phones and thought that I'd share ;) I know, I know: I'm somewhat behind the times on these, but perhaps there are some old fogies like myself out there who haven't heard about these! One of my colleagues in the History Department who knows about my love for all things Geek recently told me about the Lightsaber Unleashed app for the iPhone. This app would be cool enough in that it allows you to create your own Jedi character-- complete with photo, bio, and a custom lightsaber-- but the truly fun part is that your iPhone makes lightsaber noises when you swing it. No, I am not kidding! I spent 15 minutes last evening jumping out from behind doors and "fighting" my husband and dogs, and thinking about how cool it will be when the baby is old enough to have battles with me :) The original incarnation of this app was called Phonesaber and was a blatant copyright infringement; not suprisingly, it was removed from the iPhone's app store. It was recently re-released, though, as Lightsaber Unleashed by THQ Mobile, which owns the exclusive rights to all Star Wars mobile games. 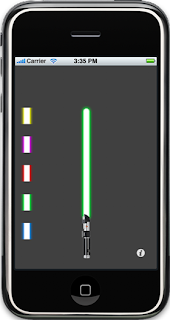 Read more about the Lightsaber app and its history here. What's your favourite mobile phone app? An interactive search system for use with a global computer network, e.g., the Internet, using a search identifying barcode to rapidly and effectively obtain a supply of related information for presentation to a user. A computer, either landline based or mobile, may be used to input a UPC code, taken from a package or advertisement or prestored in the computer, to an implementing server on the network. The server contains a database of product and manufacturer identifying UPC codes and uses the input UPC code and the database to identify the manufacturer and is programmed to then perform a search of the network to locate sites relating to or operated by the manufacturer. Also, the server may search the network on a product basis to locate other sites containing the UPC under search. Using “parsing” technology, the server “pulls out” the product description, transmits it to and places it in a random access memory (RAM) or storage of the computer, and proceeds to perform further searching relying on the product description to uncover relevant information. Accordingly, using a single input, a collection of product-related and manufacturer information is quickly assembled in the computer available for a user’s consideration all at once at any time. Would you like facts with that? "A souvenir with social feedback."